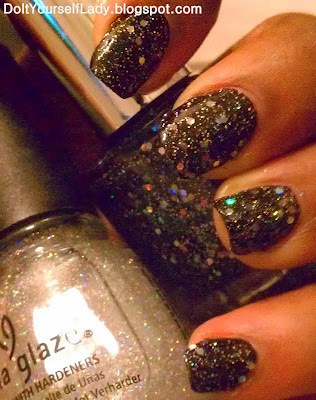 If you've been reading my recent posts, you'll know by now that I am kinda hooked on China Glaze - Fairy dust. I just can't get away from the polish. lol.. I want to use her on just about every mani. I need to stop though, lol..
Today's post is of NYX girls - Frizzy spots. It's a black jelly base polish that is best for layering IMO. I tried using it alone, and the result wasn't pretty. It required way too many coats alone, and would have taken forever to get dry. But, that was no reason to condemn the polish. I whipped out my NYC black polish, and used it as my base color. Then applied one thick coat of Frizzy spot when the base polish was dry. After that, I liked what I saw, but just couldn't resist adding one coat of Fairy dust on top. It's sad I didn't get a picture of Frizzy Spots alone, but Fairy Dust is barely noticeable in this mani, because Frizzy spots also has little Holographic glitters in it. 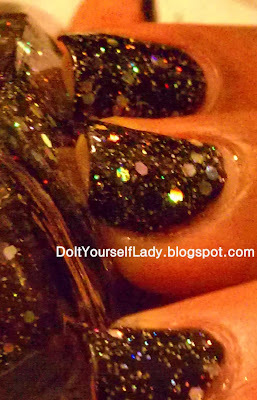 And a up-close picture so you can see the large hexagonal glitters in Frizzy Spots. Beautiful! Thanks for reading ladies. I'd like to know what you think of this polish. Do you own either of them? wow i really like them all together! its so eye catching!